This is a Bronze Age (1500BC) stone circle near Penrith in Cumbria, the sixth largest in north-west Europe. There are between 59-69 stones (everyone seems to lose count and record a different number!) that form an oval shape 340 ft. (100metres) on its long axis. Long Meg standing stone is 12 ft. (3.6 metres) high, a monolith of red sandstone, and is 80 ft. (25 metres) to the south-west of the daughter circle. 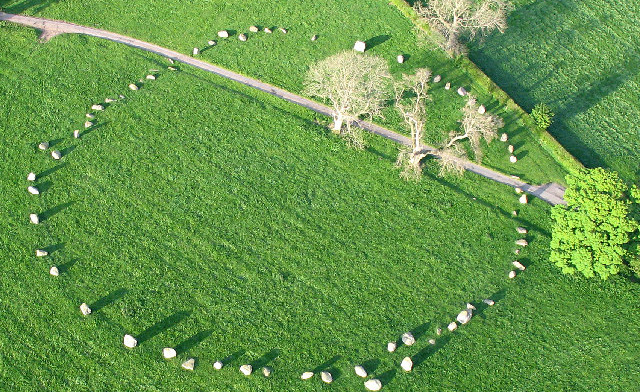 A small stone circle, Little Meg, is close by. Some of these stones seem to link with the horizon hills like those at Castlerigg. Julian Cope, like many others, was entranced and thought his time spent with Long Meg and her Daughters ‘a righteous experience’. Location: From the A66 take the B6412 or from Penrith take the A686 to Langwathby then follow the small road sign posted Little Salkeld.